1. Go big! Set your camera to take images at the largest possible size, and at the highest resolution. Don't worry about cropping or resizing - we will make them print-ready. 2. Get in focus! Make sure your photos are as sharp and clear as possible. If you have one, use a tripod, or place your camera on a flat, steady surface and take pictures on a delay. The sharper they are, the bigger we can print them. 3. Let lots of light in! While we tend to watch movies in the dark, our cinema systems look their best when they are well lit. If you can shoot with natural daylight, do so. If your room doesn't get a lot of light (a garage conversion, for instance) then put all the lights on. Avoid using flash wherever possible. 4. Be thorough! Send photos of as much of the room as possible. Images of both the front and back of the room, the kit rack, speakers, seating, disc shelf, movie poster art... The more the merrier. 5. Don't be shy! We'd also love a picture of yourself – unless you really want to remain anonymous. 6. Show us more! Got pictures of your room before it was a cinema? Or snaps of work being done? We love to see these too. 7. Send them in! Email your images to [email protected] and with the subject heading 'AV-Holic'. Provide us with some snippets of information about your setup and we'll then be back in touch. To be on the safe side, don't try to send an email with attachments totalling more than 10MB – send them in batches. 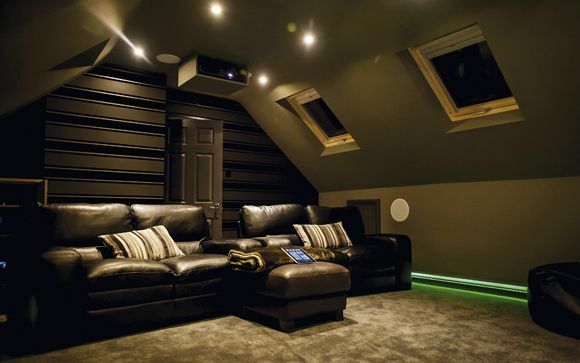 Loved the lighting and interior of this home cinema. Will save it as an inspiration for our future home cinema projects. I have worked in many home cinema projects when I was working with AVITHA in London. Loved it there.